Items that are too big to send via FedEx or UPS, or shipments with a large quantity of items must be transported to you on a semi-truck and require special freight charges. Freight charges are calculated on a per shipment basis since product sizes, weights, quantities and delivery locations vary. Your specific location is required to receive the most accurate rate. We work to find the least expensive delivery method available by getting several quotes from different carriers. It may take longer for us to provide you with a freight quote for item(s) shipped directly from the manufacturer. We'll pass the information on to you as soon as we receive it. If you don't have a loading dock, forklift or staff/assistance available, you may require additional delivery services. Without them, you will be responsible for getting your order off the truck (within 15 minutes) and inside your delivery location without any assistance from the delivery driver. 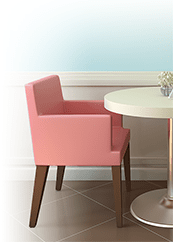 Restaurant Furniture 4 Less can provide additional Freight Delivery Services upon request. Customer is responsible for unloading the order from the truck (unassisted) within 15 minutes. Customer is also responsible for bringing it inside the delivery location. Driver will lower your order to the ground using a lift gate (platform on the back of the truck that works like an elevator). Customer is responsible for bringing it inside the delivery location. Driver will bring your order to the doorway (no stairs included), but not inside the main entrance of delivery location. This option includes a prescheduled delivery time and a truck equipped with a lift gate (platform on the back of the truck that works like an elevator). If you have questions about these services or need additional delivery services, please contact our Freight Department at 1-855-307-3863.